The Parks and Open Space Strategic Plan (POSSP) was adopted in 2012 as part an implementation strategy for the Official Community Plan (OCP). 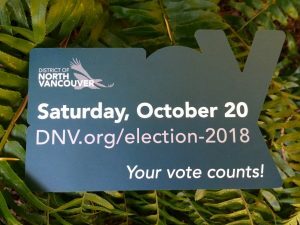 The POSSP identifies nearly 20% of the District of North Vancouver as District managed parkland, 70% of which is Alpine Parkland, like Fromme Mountain. Access to these parklands for recreation and leisure activities is highly valued by District residents. The POSSP outlines significant trends in increased trail and parkland usership, as well as aging infrastructure and facilities, and the need for more trails of all types. Meeting changing needs and demands is listed as the number one challenge and goal of the POSSP. We asked the following questions with the opportunity for each candidate to expand on their response: Questions were sent out on October 10th. Presented in the order we received them, unedited. Names are of those who submitted a response. 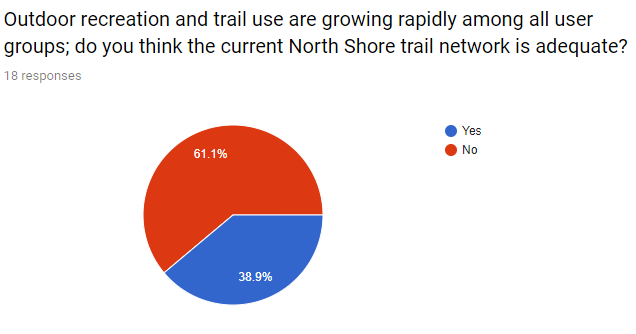 Outdoor recreation and trail use are growing rapidly among all user groups; do you think the current North Shore trail network is adequate? While we have an amazing network of trails, the demand is ever increasing, and I think we can always be looking to add new trails. Trails like Quarry Rock have likely exceeded their carrying capacity, leading to increased environmental damage and a reduced experience for trail users. How would you look to increase the carrying capacity of our trail networks utilizing the recommendations with in the OCP and POSSP? 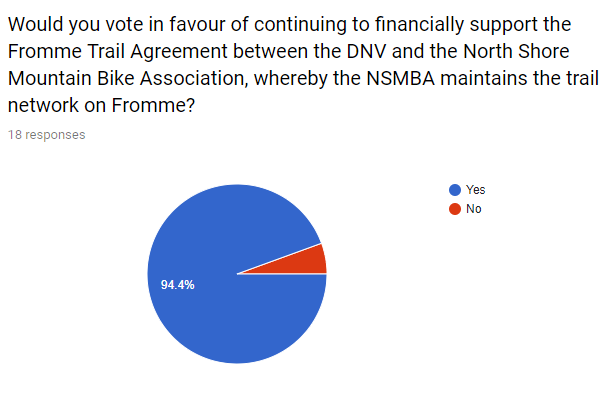 Would you vote in favour of continuing to financially support the Fromme Trail Agreement between the DNV and the North Shore Mountain Bike Association, whereby the NSMBA maintains the trail network on Fromme? NSMBA is a key partner of the District, providing our municipality with a much needed service and link to the community of trail users in much the same way our community associations give us the pulse of a neighbourhood. 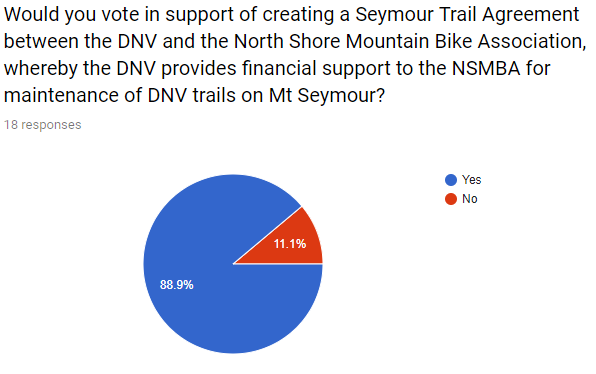 Would you vote in support of creating a Seymour Trail Agreement between the DNV and the North Shore Mountain Bike Association, whereby the DNV provides financial support to the NSMBA for maintenance of DNV trails on Mt Seymour? I think the Fromme Trail Agreement has been very successful and I would support something similar for Seymour. I have personally donated to this project, as I think it will be a great way to provide a trail experience to a variety of different user groups. As much as the partnership between the District and NSMBA has been successful in many ways, I hope to help make it even better and be a voice of support for you on Council! Improvements can always been made, but I wish to ensure that further investments in trails is balanced with other community needs. As for Quarry Rock, this is a special circumstance. We believe that we must consider some kind of restrictions in order to maintain the trail user experience in this case. Our trail system is massive with some trails better known and hence more used than others. We cannot restrict access to parkland but a focus on increased maintenance in high traffic areas is warranted. I hike the North Shore mountains about 5 days a week. I find the network is adequate for my use. We can’t keep people away – the trails are now a global attraction. Rather than add more trails, we could maintain the ones we have and also use the opportunity to educate visitors. This technique is used in the Grand Canyon and it’s effective. I wish there were an “undecided” selection since I have not seen the figures on the new costs. In essence, however, I am in favour of the agreement. Yes – this cannot come soon enough. I support the preservation of our trails and forest. It is very adequate. However, I do support increased maintenance as well as restrictions, where necessary, and a much better outreach and education re respectful use of natural trails. The use of natural trails in the DNV and beyond need to be mutually respected by the users. I will strongly support better signage and increased outreach, guidance, and education around the best practices using natural trails. We need to seperate user trails, mixed creates conflict. We need to look at the trail network from the perspective of a NORTH SHORE trail system. Much like amalgamation of municipalities would benefit planning, transportation, housing, so too would a single managed trail system. Protecting the environment and the user. Metro Vancouver for isnstance has the water district and parks overseeing trails that are used by all, but managed quite differently, because of various priorities. Makes no sense. I will continue to work towards a more cohesive model. Mixed trails don’t work, especially with the increased number of users, create inventory, map, increase partnerships. A successful partnership, that has evolved with open discussion and vision. There are several partnership opportunities, with land owners and operators that could benefit by working with the DNV and NSMBA to provide better, more efficient, recreational access to our forested lands. The Blair and Mt. Seymour Resorts provide 2 obvious partnerships. Diversity of the trail network is key, to allow a variety of opportunities for those users whose experience is minimal, restricted or growing. As technology advances and adaptive vehicles continue to evolve, opportunities for people with disabilities broaden. I am absolutely supportive of expanding these initiatives. I we are defined by our environment and outdoor recreation opportunities. We are all striving for the same thing, growing our partnerships and coming together is a great benefit for all of us, on many levels. The mountain bike community played a huge role in protecting land during GUARD’s battle in ‘96, working together will ensure those areas are there for future generations. The answer to this question is not a simple yes or no. We need to conduct an inventory of the existing trail network, and build an impact & business case for any expansion of the network. WE also need to ensure proper separation between mountain bike users and hikers/trail walkers. Mixed trails can be dangerous and we must ensure safety for all. Again, without a complete inventory of our existing trail network it is difficult to answer this question. Increased maintenance is necessary, but we need to assess the entire trail network to determine whether or not we need more trails. Without this trail agreement we will leave trail improvements, environmental protection and safety provisions to adhoc groups and individuals. Again, I support collaboration with the Mountain Biking community and other trail users. Without this type of agreement trail expansion and maintenance, as well as protection of the environment is done adhoc. Again, while I support this idea – it is imperative that these trails be built sensitive to the mixed use demands & safety of all users (bikes and foot traffic). We need to create increased separation between cyclists and foot traffic. This consideration is critical for the benefit, enjoyment and safety of all users. I would like to have the opportunity to witness the NSMBA’s trail building program first hand to see how the organization in managing maintenance, safety and environmental impacts. However, the POSSP does recommend increased trail connectivity as an overall goal. As an avid outdoor recreation user, I have spent time on almost every trail available in North Vancouver. There are many trails I travel that often have very little traffic at all. Currently, there is stress on some very specific parks (Lynn Canyon, Quarry Rock to name two). We need to spend some effort communicating some of the other trail areas we have to reduce the traffic on the few. I am also interested in upgrading facilities in places that will spread out the use as well (the parking lot at the top of Mountain Highway has been very successful, perhaps it’s time to entertain the other location that was identified for more parking). As with the previous question, I believe we need a combination of more than one solution. We need to increase the amount of trail maintenance we do. The POSSP recommended continuing to work with trail volunteer organizations for this purpose. We also need to find ways to reduce the traffic on the most popular routes, and encourage the use of the road less travelled. This agreement over time has benefitted the network of recreational trails in the area. Hikers use many of the trails as well (particularly the uphill climbing sections). I would specify on this that it is important to work within the boundaries of the Parks Department budget for any increased spending. I like the concept, especially the twinning of the downhill section of the loop. Under the current trail structure, it makes it very difficult for runners and dog walkers to use that section when bikes are coming down. It also fits with one of the “Guiding Principles” from the POSSP for accessibility. Trail networks on our local mountains are one of the best investments we can make in the long term health of our community. Trails support personal health, wellness and community connection as well as a host of small, locally owned businesses. Trails are one of the reasons many of us moved here and choose to stay here. There are significant gaps in our trail network, particularly for the most skilled and least skilled riders. The trail network would benefit from more connectivity between key origins and destinations (Dempsey/Braemar to Yellow Gate on Fromme and second switchback for example). We need more community riding hubs, like pump tracks, in our urban areas to celebrate our biking culture. Some trails, such as Quarry Rock and the Grouse Grind, have become so overwhelmingly popular that they will either need to be completely redesigned or have their use limited. Building more trails and a more varied trail experience distributes users and can reduce pressure on individual trails. Building trails to modern standards with an ongoing maintenance plan will provide a better user experience and reduce environmental impacts due to trail wear and erosion. My experience is that the NSMBA offers the best value to the District and fosters a model of community stewardship of a shared resource that would be sought after around the world. I also believe these types of operational agreements are best dealt with a staff level. It may be difficult, but I think the most value would come out of having all four landowners on Seymour (DNV, Metro Vancouver, BC Parks, CMHC/BSRST) come together with a single agreement and trail plan for Seymour. A lot of benefit would come out of aligning trail standards, permitting procedures, signage and funding. Yes, this is a great opportunity to make our trail networks open to more people. Again, these types of decisions would usually be made at a staff level. I was the President of the NSMBA from 2008-2013 and have a deep understanding of both the opportunities and challenges facing our trail networks. I have my favourite trails but have not read a recent report on trail usage, number, condition etc the question above was only yes or no answer. Might consider some form of fee structure for primarily tourism spots for non BC visitors to put back into maintenance . We need a better communication platform to promote the work being done. As more people both local and visitors access our trail network we cannot build walls to shut people out to an important free natural resource , but must strive for sustainability to protect integrity and to match users of all types and ages with appropriate use . Protecting the environment is my priority and connecting people to nature, along with education is one of the best ways to get people to care more about it. I’m a biker and a hiker and I don’t think multi-use trails work well for either participant. It’s important to ensure that sensitive environmental areas are well-marked and protected and that there are more educational opportunities on the trails. I think it makes sense to map our existing inventory of trails first and take a holistic approach. Which trails could be biking only, which could be hiking only, are some in more sensitive area, etc. Our trails cross through multiple jurisdictions which can be a challenge. A good first step would be to map our existing trail network to have a baseline. From there, we could determine best uses for all user groups taking account sensitive environmental areas. I completely agree that Quarry Rock (in particular) has likely far exceeded its LAC (limits of acceptable change) and we have to do more to protect trails from overuse. Making trails accessible for adaptive mountain bikers is important and I’m open to learning more. I’m very familiar with Seymour (as both a biker and hiker) and again, I’m not a fan of multi-use trails. I’m open to learning how we can make the mountain accessible to more people while protecting sensitive areas. Our network of trails is impressive and good but we have to also protect wilderness area and Eco systems. Increased managment – I have heard that Quarry Rock or its trails are on private land, not park. We have to maintain safety and respect private land at the same time. Not sure about this yet. I need to learn more before voting. Trail networks should be expanded, enhanced and maintain to keep up with levels of use. Northshore mountains attract attention from all of the Lower Mainland and expanding the trail network would limit the impacts on any one section. NSMBA has successfully leveraged community support by encouraging trail users to maintain and expand trails. Steady financial support amplifies this community effort and benefits the entire community. Please note – As I am not fully aware or have full knowledge of the Fromme Trail agreement (similar say to you not having full information of other say sports) I am currently unable to be either For or Against continual Financial Support. 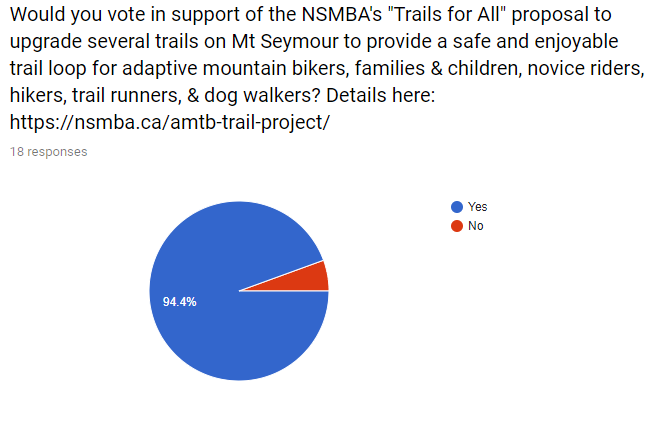 As previously stated I am in Support of a Seymour Trail agreement, but as yet unaware of what maintenance the NSMBA would be fulfilling so as to receive financial support at this moment. So open minded. Without going to your above website “Trails for all’ proposal sounds great and in line with my below final comments. Am prepared to be involved of this. Hello NSMBA, I am a senior and I currently do not use any Nth Van Trails. However, Mountain Biking etc is a very Popular activity of many people, whether they live on the Nth Shore or elsewhere and is here to stay. Unfortunately, as well you may well know there has been some past controversy at the beginning when Mountain Biking started becoming popular on the North Shore and the local neighbourhood’s began to have say parking etc problems. This appears to have settled down somewhat, whereas as I as yet do not use the say walking trails, I am not familiar with was has occurred regarding apparent -agreements with the District of Nth Vancouver. Therefore I would believe that you would agree that if any of you were in my position, that you have to hold back of any support or unsupport regarding all your questions. 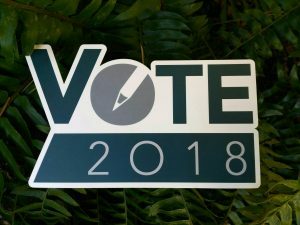 If elected I would hope to be involved by way of setting up in having a Trail Harmony situation, where if not already in place, that the NSMBA plus regular Hikers plus say Dog walkers and general simple Family forest amblers – get together to have an understanding of what each group likes to harmony share all round. Mountain Biker or NSMBA member what would consider best for all those who use the North Shore Trails. Thank you, John Harvey. As a frequent trail user I have seen an explosion of new users over the last few years. Particularity concerning is the lack of preparedness that I see. I don’t want to restrict use but I think we need more suitable trails for those wanting a natural experience but are not experienced. Unsure of the breakdown of the agreement but I’m very willing to work with community associations like NSMBA for the betterment of all. Inclusivity is very important to me. I love the outdoors and want to continue to make it accessible for all but never at the expense of other user groups and, most importantly, the environment. I think our trails are like roadways, the more roads you build the more traffic finds its way to fill the space. Yes, as long as all user groups feel safe and welcome when accessing the Fromme trail network. Yes, as long as all user groups feel safe and welcome when accessing the trail network. 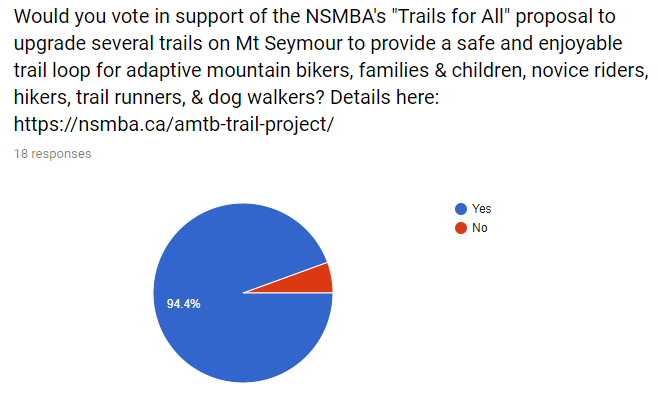 Once again, my support is contingent on the NSMBA supporting / acknowledging that the trail network is intended for the safe enjoyment of all user groups (walkers, seniors hiking groups, trail runners etc. ).